Back of the net, or back to the drawing board? Fluid Soccer in the US, Fluid Football in Europe, we've had our eyes on this game for a little while now. Mobile soccer gamers have been spoilt for choice over the last 12 months , with the likes of New Star Soccer consuming a frightening amount of our spare time, and FIFA inching steadily closer to greatness. 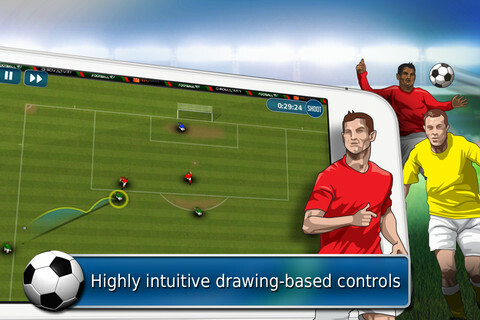 Fluid Soccer is a far more tactical affair, and you need to juggle manual player positioning with build-up strategy, prepare and execute passes, and gradually work your way towards a final shooting position. Get it passed the keeper and you move onto the next of many challenges. Each player on the screen can be moved individually, so there's plenty of freedom to create your own build-up strategy as the opposing team moves in response. Holding your finger on the ball lets you select a player to pass to, or an area of the pitch for a team-mate to run into. Commentary duties are taken on by ex-Premiership commentators and presenters Richard Keys and Andy Gray. The commentary's a nice touch in a typically muted genre, although it naturally lacks the depth of a console experience, with only a brief snippet of analysis provided by the team at the end of each attempt. Sadly, we were more than once congratulated on a successful attempt having just sent the ball into the upper stands. If you're hopelessly stuck on a challenge, you can spend some of the coins you earn through gameplay on a hint from Andy, or spend even more to bypass the challenge altogether. While we don't doubt the realism of both the advice given and the design of the challenges, there's usually a far slicker, quicker, and frankly more enjoyable solution to be discovered on your own. The challenge in the game comes more from gaming the objective system than using sound tactical instinct. You'll often be tasked with passing the ball five times before scoring, but the result is more often than not a muddled and arbitrary scramble to the goal, while your slicker, one-two attempts are both more fluid and satisfying. It's gaming the mechanics for the sake of it, rather than for enjoyment or satisfaction. The practice mode is rather unfortunately under-developed and consists of little more than simply taking static penalty shots at a goalkeeper who rarely deviates from a set position while an eight minute counter ticks down. The lack of variety or scoring seems odd, and while it might seem unreasonable to expect a high score tally in a practice mode, why in that case is there a ticking timer that's replenished with each goal? It'd be easy to think we were hopelessly down on Fluid Soccer, but this is far from a broken or bad game. We enjoyed the new tactical approach to soccer gaming, even if we grew frustrated at the rather "sticky" feel of moving characters into position, or the pass mechanic's tendency to not register and simply send the player meandering around the pitch. Enjoyable too are the many and varied set-piece challenges, although you'll have to spend a pretty penny to unlock them all in the cash shop. 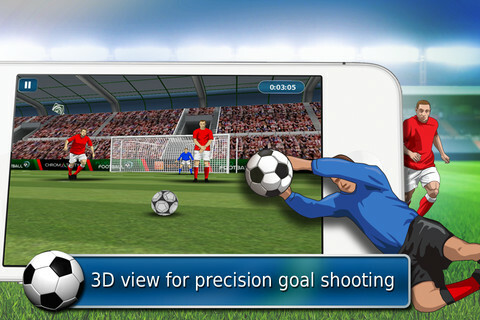 A high bar's been set in both arcade and simulation soccer games on the App Store over the last 12 months, and while Fluid Soccer has its moments, they never shine as brightly as the competition's. A pity, as we've been itching for a new football fix, and we had high hopes that this game would lead us triumphantly into the new Premiership season. 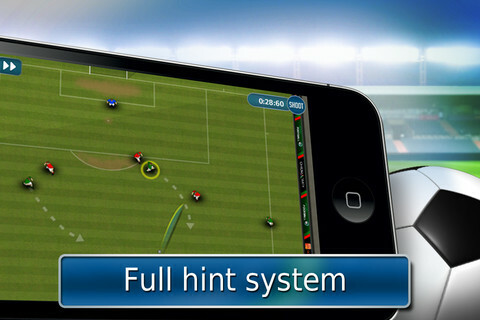 What's Hot: A refreshingly different slice of soccer gameplay with a wide variety of challenges included. What's Not: You'll have to spend more than a few dollars to get at all the game. The controls can also be frustratingly fussy.